OK, no cheating now. Who do you know with a musical career that encompasses being a recording and touring member of Hiss Golden Messenger, has collaborated with the Indigo Girls’ Amy Ray, performed with greats such as Mavis Staples, Bruce Hornsby and the legendary John Prine and still found time to both play with, and be a Musical Director for, The Blind Boys of Alabama? (The more astute among you may have looked at the title of this review and made something of a bold guess). 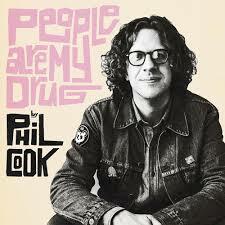 Phil Cook has a pretty impressive musical C.V. and while his second album ‘People are my Drug‘ clearly draws on some of that background, Cook has managed to craft an album that is immensely enjoyable and, thanks to his brother and long-time collaborator, Brad Cook, who takes on production duties, has a sound and feel that is clearly his own. His debut solo album, 2015’s ‘Southland Mission‘ received high critical acclaim, but ‘People are my Drug’ moves things to a whole new level. The album starts with the excellent single, ‘Steampowered Blues,’ which sets the tone for the rest of the album with a swing feel derived from New Orleans step rhythms – making it very hard to resist shimmying along to. This can be somewhat embarrassing if you are walking down the street listening on headphones! Aided by his band The Guitarheels (drummer JT Bates, bassist Michael Libramento and pianist James Wallace), the album quickly gets into top gear with the second track ‘Tide of Life‘ starting with a full-on gospel vibe which then manages to mix in some excellent guitar licks before returning to the gospel feel for the last few bars of the track. The music is in full flow now as we move into the heart of the album with ‘Miles Away,’ beautifully co-written with Amelia Meath (Sylvan Esso) followed by the skillfully penned and hugely moving ‘Another Mother’s Son,’ a track which will resonate with, and maybe even bring a tear to the eye of, any parent. The rest of ‘People are my Drug‘ now fairly races along, with tracks like the slow-paced ‘Tupelo Child’ contrasting nicely with the bouncier ‘Deeper Kind‘ keeping up the already high standard. Only too soon, the 36 minutes that it takes to play the 9 tracks is over and it leaves you wanting more. That’s not a criticism of the length of the album, it’s simply that you don’t want it to end! While much of ‘People are my Drug‘ has a gospel and delta blues vibe to it and some of the lyrics have a touch of that old-time religion, don’t let that put you off in any way at all. This album just swings along beautifully and anyone who can listen to it without nodding and swaying along with the rhythm of the music has no soul! An excellent sophomore album that gets better with repeated listening.